The mission of the Main Street Gardnerville Program, in partnership with our stakeholders, is to revitalize downtown Gardnerville utilizing design, organization, promotion & district vitality to develop the unique identity and preserve the historic nature of our community. Main Street Gardnerville was the first community to receive the Main Street designation in Nevada and is an Accredited Main Street America program. In the Main Street Gardnerville district we have learned to cherish our past while planning for and moving into the 21st Century. Gardnerville has many dedicated businesses and individuals working daily to maintain a lively and economically successful downtown. Spend a little time with us and you will find we are an authentic, thriving, great American downtown. Whether you are here for business or planning to visit our downtown, we hope you will find what you’re looking for on our website. Governed by a Board of Directors, Main Street Gardnerville is composed of stakeholders of the area who are interested in the revitalization and preservation of our Downtown. Main Street Gardnerville is neither a business association nor a chamber, but rather, an association of people who promote and protect a place. We receive training and technical support from the National Main Street Center. Our Design committee gets Main Street into top physical shape. Capitalizing on its best assets — such as historic buildings and pedestrian-oriented streets — is just part of the story. An inviting atmosphere, created through attractive window displays, parking areas, building improvements, street furniture, signs, sidewalks, street lights, and landscaping, conveys a positive visual message about the commercial district and what it has to offer. The District Vitality committee strengthens our community's existing economic assets while expanding and diversifying its economic base. 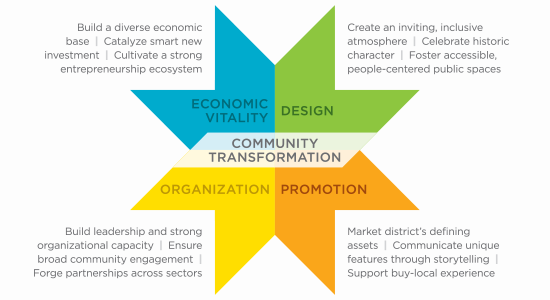 Organization involves getting everyone working toward the same goal and assembling the appropriate human and financial resources to implement a Main Street revitalization program. This means recruiting volunteers and securing sponsorship’s to help make our projects and events happen. The Promotion committee sells a positive image of the commercial district through fundraisers and events. They encourage consumers and investors to live, work, shop, play and invest in the Main Street District. In 1861, John and Mary Gardner homesteaded a large tract of land for their ranch. Around 1877, they sold seven acres of the tract to Lawrence Gilman. Mr. Gilman purchased the Kent House in Genoa. In 1895 he moved the house to Gardnerville. The Kent House became the Gardnerville Hotel and Gardnerville was born. After observing the activity of the growing community of Gardnerville, the Harris family also decided to move their dry goods business from Genoa to Gardnerville in 1895. In the spring of 1896, Arendt Jensen erected a commercial building for his General Merchandise Store on Main Street. And they just kept coming – a butcher shop, a shoe store, a barber shop and more saloons to what had now become a thriving town and center of activity in the Carson Valley. German, Danish, Swiss, Chinese and British immigrants were prominent figures in the town’s growth and popularity. Then in 1898, the Spanish and French Basque shepherds immigrated into the area, tending some 13,000 sheep in Carson Valley, increased to 25,000 by 1925. In 1918, several Basque restaurants and inns were opened. Basque dining has continued to play a prominent role in Gardnerville. Gardnerville began as a way station along a busy wagon road filled with miners on their way to Bodie, California over 125 years ago. Today, you can still see and feel Gardnerville’s cultural heritage. You will notice the presence of our Basque and western history in all the new shops, businesses and buildings in our Main Street district. (#MainStreetProud) Our town takes pride in how we appear to visitors so from our springtime hanging baskets and potted planters to our year round commemorative benches and our historical Basque mural we are proud of our heritage and want to invite you in to be a part of it all. Gardnerville may have began as a way station along a busy wagon road, but we are striving to make Main Street Gardnerville a destination! With improvements to buildings, addition of businesses and roadside stops, we know the future of Gardnerville is bright and will provide a friendly town that weary travelers will look forward to exploring . From our trail heads to our downtown, from the country roads to the foothills, we know Gardnerville will leave everyone wanting more. We will be committed to continuing the traditions of our past as well as creating new traditions. Main Street Gardnerville invites you to come again and enjoy the old with the new – Experience the Past, Enrich the Present, Embrace the Future! "Main Street in Bloom" Happens in early June when the flower baskets are hung until Fall.